Just a reminder that I’ll be on a panel along with members of the DGA, IATSE and SAG to speak about “Working With Unions”, this Saturday, September 20, 9:30-10:30am at the Albuquerque Hyatt Regency, as part of the Albuquerque Film Festival. The panel discussion is open to the public, and if you’re attending the Film Fest, I hope you’ll stop on by. I’ll be speaking on a panel about entertainment unions at the Albuquerque Film Festival on Saturday, August 20 (9:30am at the downtown Hyatt Regency). Members from the DGA, IATSE, and SAG will join me as I represent the WGA, and together we’ll discuss how working with guilds and unions … well, works. 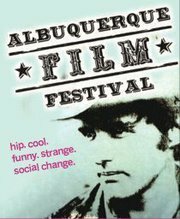 This will be my first time at the Albuquerque Film Festival, which this year is premiering legendary writer/director John Sayles’ newest work. And as the film and television biz in New Mexico has reached a significant economic crossroads, it should be an interesting panel. If you happen to be near Albuquerque or Santa Fe on that date, I’d be delighted if you dropped by for the panel discussion and said hello.